THE quarries of Scotland contribute largely to the wealth of the country, and afford employment to a great number of persons. Centuries ago, when the danger and inconvenience of wooden and thatched houses came to be generally felt, more substantial materials began to be used in the construction of dwellings. At first loose stones were collected by the builders, and when the supply of these became exhausted the unbroken beds of rock were drawn upon. Quarrying then became a trade, and has since gone on extending and increasing in importance. In most quarters of Scotland sandstones and granites well adapted for building purposes exist, and the result is that no country in the world can show more substantial houses than those occupied by the great body of the people north of the Tweed. The produce of the granite quarries of Scotland is famous both in England and abroad; no finer paving-stones exist than those obtained in the counties of Caithness and Forfar; and the slates of Easdale and Ballachulish are equal to any. Aberdeenshire is the chief seat of the granite trade, and has been associated with it for about 300 years. When granite was adopted to supplement the other building material available in that county, a supply was drawn from the loose blocks which lay about in great abundance. Granite quarrying, as now understood, was not begun till about the middle of last century; and not until a number of years afterwards were the modes of working the material such as to promise for it a widely extended use. As time wore on, the quarrying and working of granite came to be better understood. In the year 1764 the export trade, now of so much importance, was begun. About that time it was resolved to have the streets of London paved, and the durability of Aberdeen granite having been tested, that material was fixed upon as the most suitable. From the preference given. to it in that instance has arisen an export trade not confined to the metropolis or to the supply of paving material, but dealing with every part of the kingdom, and supplying every kind of stone-work. A few years passed, the trial made of the durability of Aberdeenshire granite proved highly satisfactory, and the consequence was a demand which led to the opening up of quarries in the neighbourhood of the city of Aberdeen whore the supply of granite is abundant. It appears, from a reference in "Kennedy's Annals," that the contractors for paving the streets of London began quarrying operations among the rocks on the sea-coast of the lands of Torrie, and transported the stones, when roughly dressed, to London. They soon found, however, that such was a very expensive mode of furnishing the article wanted, and, relinquishing their original plans, they entered into contracts with the masons of Aberdeen for a supply of stones suitable to their purpose at certain specified rates. This system has continued up till the present day; and although one or two London firms have leased quarries and work them, they do so for local as well as for export trade. Machinery was first used in quarrying granite about the year 1795, when stones of large dimensions were ordered by the Admiralty for the docks at Portsmouth, at that time in course of construction. The expense of procuring large blocks of stone, such as those required for the Bell Rock Lighthouse and for the Waterloo and London Bridges, must have been rather heavy; but the name that Aberdeen granite gained by being used for such works had the effect of increasing the demand. And this was enhanced locally by the building of Union Bridge and the opening up of Union Street about the beginning of the present century. From that time the trade may be said to have been fairly established, and year by year it increased in importance, the demand for London alone being productive of great good, not only to the town and county, but to the shipping of the port. During the year 1817 the quantity of stones exported to London was 22,167 tons, the value of which, including freight, was about L.23,275. In 1820 the late Sir John Rennie recommended to the Admiralty the use of stones from Aberdeen for docks being constructed at Sheerness. In 1821 the exports, principally of building and carriage-way paving-: stones, amounted to 34,687 tons, and in 1831 to 36,252 tons. During the interval the greatest increase in the export trade was in kerb and carriage-way stones, which in the ten years advanced by some 12,000 tons. All the quarriers in Aberdeenshire produce kerb and causeway stones, and some devote their attention almost entirely to that branch. Within recent years various improvements have been made in preparing kerb, causeway, and tramway stones for the London and other markets. As in the case of every other art when in its infancy, for several years little progress was made either in keeping the quarries in good working order or in improving the instruments of labour. In fact, it is only recently that machinery and steam-power were introduced to work granite quarries. From the great strength of the stone, it has to be blown from its bed by gunpowder; otherwise, the processes followed are the same as in quarrying freestone; but on account of the extreme hardness of the granite, the cost is five or six times greater. Of late years the bores in the stone have been made considerably larger in diameter, and now the common depth may be said to range from four to twenty feet. After the blocks are thrown out of the "face" of the quarry by blasting, they are cut with wedges into the various sizes required. The blocks are then handed over to masons, who work them into the different "orders." Keeping out of view the large number of skilled artisans working in granite in the city of Aberdeen, the quarries of the county give employment to upwards of 1000 hands. The quarries at Kemnay, leased by Mr John Fyfe, are the largest in the north, more material being sent out from them than from all others in the county. Situated in close proximity to the Kemnay 'station, on the Alford Valley Railway, every facility is present to develope the work. On an average Mr Fyfe gives work to 250 men all the year round; and these, with the aid of steam-power; which he was the first to introduce in the quarrying of granite, turn out several thousand tons of stone monthly, which goes partly to the home and partly to the foreign markets. Mr Fyfe, it may be remarked, has the contract for supplying the principal stones for the Thames embankment; and besides that, he does an extensive business in kerb and paving stones for London and elsewhere. The Kemnay granite is of a light colour, and from its close texture has become very popular. Since 1858, when the quarries were first opened, Kemnay, formerly a country hamlet, has become a place of some importance, a number of houses for the accommodation of the workmen and their families having been erected by Mr Fyfe. Rubislaw quarry, leased by Mr Gibb for several years, produced a large quantity of granite of a fine dark blue colour, of which a great part of Union Street, Aberdeen, is built. The other quarries of note in the county are those of Sclattie, Dancing Cairn, Persley, &c. From all these, as well as from Cairngall, leased by Messrs Alexander Macdonald, Field, & Co., a good substantial stone, known as Aberdeen granite, is got. The Cairngall quarries, in particular, produce a fine small grained stone, admirably adapted for polishing and for ornamental work. In fact, for those purposes, no better material has as yet been found. It was from Cairngall that the sarcophagus for the remains of his late Royal Highness the Prince Consort was taken. All over the kingdom monumental work in granite from this and the other Scotch granite quarries may be met with. The red or Peterhead granite is found at Stirlinghill, near Peterhead, about thirty-two miles from Aberdeen. It is from that district that the principal supply for the Aberdeen stone-yards is obtained. The red granite is commonly used for mural tablets, gravestones, &c.
An important branch of the granite trade is the conversion of the stone by carving and polishing into architectural ornaments and monumental work. It had its origin in Aberdeen; and the largest granite polishing establishment in the country is that of Messrs Alexander Macdonald, Field, & Co. of that city. The first experiments in granite polishing were made by the late Mr Alexander Macdonald, father of Mr Macdonald of the above-named firm, about the year 1818. Previous to the year 1819, the only tools used in dressing granite were small picks, and it was when the County Rooms, Union Street, Aberdeen, were being built in that year that chisels and "puncheons" were first tried by some free-stone masons, who, as work was scarce in their department, undertook to work in granite with the tools used in dressing sandstone. In preparing granite blocks for polishing, such tools, tempered to suit, were found to be extremely serviceable, and they were generally adopted. About the year 1830 Mr Macdonald removed his works from King Street to the extensive premises now occupied by his successors in Constitution Street. There, in 1839, he was joined by Mr Leslie; and under the firm of Macdonald and Leslie, the granite polishing trade of Aberdeen became extensively known. Up till that time, and, in fact, till within the last seventeen years, this was the only manufactory of the kind; and now, although there are in Aberdeen several similar establishments, none come up to it in extent or importance. One of the chief improvements introduced by the late Mr Macdonald in preparing granite blocks for polishing was the use of patent axes. The rough blocks sent from the quarry require to be finely dressed before they are fit for polishing. After being dressed to a somewhat even surface, axes are used; and until the introduction of the six and eight bladed axe by Mr Macdonald, the work had to be done with light picks and single-bladed axes. The "compound axes," as they are called, are steel chisels clamped together so as to present a face to the stone of six or eight edges on a space of two inches. Mr Leslie continued in partnership with Mr Macdonald till 1852, after which the business was carried on by the last-named gentleman until his death. Since then his son, the present senior partner of the firm of Alexander Macdonald, Field, & Company, and the other partners, have still further extended the name and reputation of the original Aberdeen granite works. At the polishing establishment under notice the granite is brought into the yard in blocks of various sizes, according to the nature of the work to which they are to be devoted. By means of travelling cranes the blocks are moved from place to place, or hoisted on to trucks running on rails which traverse every department of the works. In the preparation of slabs of granite for panels or mural monuments, the first operation is to saw up a block into pieces of the required thickness. This is done by powerful sawing-machines propelled by steam. The cutting part of the machines consists of a number of parallel blades of sheet iron fixed in a strong frame—the space between the blades determining the thickness of the slabs. The blades are drawn backward and forward on the stone, being meanwhile supplied with sand and water, which help the saws to grind down the granite. The process is exceedingly slow, some months being required to cut up the larger blocks from which slabs are made. The granite is polished by machinery, except in the case of intricate carvings, which have to be operated upon by hand. A mixture of sand and water is applied in the first instance, and after the surface has been rubbed smooth by means of these, emery is used. Under this treatment the stone assumes a glassy surface, the brilliancy of which is enhanced by a final polishing with oxide of tin. Granite exists in almost exhaustless abundance in the stewartry of Kirkcudbright. The three principal districts where it is found— namely, that in the north-west, extending from Loch Dee to Loch Doon; the second, stretching from Loch Ken to Palnure Water; and the third, from Criffel to Craignair—occupy nearly one-fourth of the surface of the stewartry. Though the existence of the granite was well known many years ago, the proper mode of working it was not undeittood; and no idea being entertained of the important uses for which it could be made available, no attention was until recent years paid to quarrying or working this valuable rock. When a gentleman's residence, or other decorated building, was being erected in the locality, the corner and other principal stones in the structure were formed of the. Old Red Sandstone from Dumfriesshire. And when the bridge over the Dee at Tongland was built—in the years 1804-5-6, after a plan by Mr Telford, the celebrated engineer, at a cost of nearly L.7000—it appears never to have entered the mind of any one concerned to utilise the granite boulders which lay scattered at convenient distances from the site of the bridge. On the contrary, the stones employed in the erection of the structure were tram- ported at great expense from Annan and the Isle of Arran; and they were subject to a heavy duty, which greatly augmented the aggregate outlay. The late Mr Andrew Newall, Dalbeattie, had for some years previously carried on in a small way the trade of granite hewing; but it was not till 1825 that anything like extensive operations in the working of granite were commenced in the district. In that year the Liverpool Dock Trustees leased from the late proprietor of Munches—Mr John H. Maxwell—a portion of Craignair Hill, in the immediate vicinity of Dalbeattie, with the view of opening a quarry on it to obtain blocks suitable for dock purposes; and having entrusted the supervision of the works to a confidential and skilled manager, that gentleman began operations with so much energy and satisfactory success, that within a few weeks he shipped, to Liverpool the first instalment of stones. With these the engineer of the docks—the late Mr Hartley—was so well pleased, that orders were immediately received to open another quarry on the hill, and engage as many more men as could be obtained. These instructions were as speedily carried out as the efficient conduct of the already extensive existing operations at the hill would allow. At those two quarries some hundreds of workmen and labourers were daily employed, and some thousands of tons of the wrought material were annually sent to Liverpool, and applied to dock purposes only. That was the first impetus given to the granite trade in Galloway. Its beautiful product, as inspected on the banks of the Mersey, soon made Craignair famous; and there the works continued to be prosecuted with unflagging energy and satisfactory success till 1832, when the manager having failed in his efforts to obtain blocks of the very large dimensions required at the docks, except by incurring great expense in the removal of the superincumbent mass of dAris, opened a quarry on the farm of Kirkmabreck, in the parish of that name, in the south-west of the stewartry. Two of the Craignair quarries are worked by Messrs D. H. & J. Newall, who turn out large quantities of dressed granite. In addition to these quarries there are two others in the hill. One is worked by Mr Charles Newall, who employs a considerable number of hands, and is one of the contractors for supplying stones for the Thames embankment. About four years ago Mr Hugh Shearer of London was successful in obtaining the first contract for supplying granite for the Thames embankment, and opened several new quarries on the Munches estate, reopening at the same time four quarries which had formerly been worked by the Liverpool Dock Trustees. Such is the beauty and durability of the stone that it is said the engineers of the Board of Works prefer it to any other; and Mr Shearer and the partners he assumed about a year ago—the designation of the firm now being Messrs Shearer, Smith, & Co.—have supplied, and are still supplying, many thousands of tons of material for the great work referred to, and have besides sent large quantities of paving stones into Russia, several Mediterranean ports, and South America. They have also furnished a great part of the paving stones recently used in Edinburgh, Glasgow, Leith, and some of the principal towns in England; and are at present applying their forces to the conversion into paving-stones of the hundreds of thousands of tons of material accumulated in their "spoil heaps," which has hitherto been treated as waste. It is largely owing to the enterprise of Mr Shearer in securing the use of the stone in the Thames embankment, that the Kirkcudbrightshire quarries owe their present celebrity. Messrs Shearer, Smith, & Co. employ from 300 to 600 workmen, according to the demands upon them. Their works have a direct connection with the railway system of the country, and they have a loading pier on the river Urr, so that they have ample facilities for transporting their produce. The stones for the Thames embankment are forwarded by rail, dressed. and ready for the builders. In the parish of Kirkmabreck very extensive operations in granite working have been carried on for a long series of years. Adjoining the public road leading to Gatehouse, about two miles from Creetown, is an extensive quarry, leased by the Liverpool Dock Trustees. All the stones procured there are used for dock purposes only. There are four vessels constantly employed by the Liverpool Company in transporting the stones to their docks, and other vessels are often engaged in the same service. On one occasion, when the quay at this place was transferred from one proprietor's land to that of another, there were nineteen vessels constantly occupied for six months in the removal to the banks of the Mersey of the material that had accumulated at the abandoned wharf. About two miles east from these works, on the farm of Bagbie, on the estate of Kirkdale, belonging to Major Rainford Hannay, a quarry was opened in February 1864 by Messrs Forrest, Wise, & Templeton. The stone of this quarry is of first-class quality, and, like that at Kirkmabreck, can be worked without blasting. In connection with their works the firm have a commodious quay erected for the shipment of such portions of their prepared materials as are transported by sea, and between it and the quarry they have constructed a tramway. There is still another quarry in this neighbourhood deserving notice. It is situated near the apex of the hill at whose base are the Kirkmabreck quarries, and almost in a straight line from these works. It is within the farm of Fell, and hence called Fell Quarry. It is worked by the Scottish Granite Company. Messrs Newall have an extensive polishing establishment. The process of polishing is of recent introduction into Galloway, the first experiments in it having been made by the late Mr Andrew Newall a few years ago. By Messrs D. H. & J. Newall the art has been brought to a state of great perfection, and is extensively carried on by them with a constantly increasing business. From their quarries on Craignair the firm are supplied with part of their material for polished work. But large quantities of red granite are obtained from the island of Mull. While the produce of the latter is exported in large quantities, that of the former is used almost entirely at home. The Old Town of Edinburgh was built of red or grey sandstone, obtained in the neighbourhood without much labour in quarrying. The newer portions of the city have been built of stone drawn chiefly from the extensive quarries of Craigleith, Ravelstone, Redhall, Humbie, Binnie, and Hailes, which are situated on two extensive tracts of sandstone lying to the west of the city. Craigleith Quarry has been worked out to a great depth. The stone is hard and difficult to excavate and dress. Before railways afforded ready means for conveying stone from a distance, Craigleith was a valuable possession, especially about forty or fifty years ago, when the "liver" rock—as the great unstratified beds in quarries are called—was abundant; but now little stone is being drawn from it, the demand being met more cheaply by softer stone obtained from various quarters. It is still preferred for steps and plats in staircases. Among buildings composed of Craigleith stone may be mentioned the University and the houses in Charlotte Square and Randolph Cliff, Edinburgh. The same quarry supplied some of the material used in the construction of Waterloo Bridge, London, and large numbers of plats and steps for houses in London and elsewhere in England. The Ravelstone Quarry yields stone similar in quality to that of Craigleith. At Redhall the rock which is being worked be-longs to the lowest sandstones of the coal formation. The stone is of fine quality, and very durable—its durability depending chiefly on the large proportion of silica that it contains. So abundant is the silica that it is frequently found concentrated in nodules. These nodules give great trouble to the quarrymen, who call them "white whin." The nodules are among the curiosities of geglogy, and the minds of geologists have been puzzled to account for their appearance, because they are evidently of the same origin as the softer stone in which they are embedded, and contain the same fossils. As specimens of Redhall stone in Edinburgh, St John's and St Paul's Episcopal Churches, and the houses of Heriot Row, may be men¬tioned. It was in Redhall Quarry that an improvement on the primitive method of breaking out the stone by means of wedges and small charges of gunpowder was made. The quarry belongs to Mr James Gowans, of Rockville, who is the most extensive lessee of quarries in Scotland. About eighteen years ago Mr Gowans intro¬duced the method of boring, at a suitable distance from the "face " of the quarry, a row of holes of great depth, and charging these with gunpowder, which was ignited by a galvanic battery. The holes, which are from three to four inches in diameter, are bored by a machine Immense quantities of stone are in this way obtained by a single operation, and at less cost than by the old mode. Humbie Quarry, near Kirkliston, was worked for many years, and supplied some good building material; but it is now abandoned, on account of the cost of raising the stone being unfavourable to its introduction into the market in competition with the produce of quarries more advantageously situated. Since this quarry was closed another has been opened further north on the Hopetoun property, which is called New Humbie. The stone from it has been used in street buildings, especially in the Newington district. The stone from Kingscavil Quarry, near Linlithgow, has been long in use for foundations and inside work. The Binnie Quarry, near Uphall, produces stone of equal durability with those already mentioned, but differing in certain respects from all. Binnie stone was extensively used in the buildings erected in Edinburgh and the neighbourhood about the year 1835. The Scott Monument, Donaldson's Hospital, the National Gallery, the Commercial and British Linen Company's Banks, Edinburgh, are built with this stone, and the latest great work in it is the Bank of Scotland. Binnie stone, on account of the bitumen which it contains, has generally a freckled appearance; and wherever this is most distinctly marked, the stone is most durable. In some specimens the bitumen is so abundant that, if a small piece of the stone be placed in the fire, the bitumen will be seen to bubble up. The quarry is situated in a locality abounding in shale, and the bitumen is supposed to have flowed in from the shale beds, and the stone become impregnated with it. Fissures in the quarry are filled with bitumen, some of which was collected by Mr Gowans in 1850, and made into candles, which were shown at the Exhibition of 1851. He was thus on the verge of demonstrating the -value of the shale beds of Scotland, which have since become so valuable and important; but the prize fell into other hands. In the buildings of Binnie stone which stand in a comparatively pure atmosphere—such as the National Gallery and Donaldson's Hospital—the stone is of a brown tinge, and has reddish streaks through it. These are caused by the presence of iron. In the case of the Commercial Bank and the British Linen Company's Bank, the stone has been smoked until it presents a uniformly dark surface on which the streaking is not apparent, though the stone appears to be equally durable. The Hailes Quarry produces stone which, though not adapted for the external parts of buildings, is useful from its laminated structure for making plats and steps. The foundations and inner walls of houses are also built of it. For such purposes it is of great value, as it can be worked at a comparatively small cost. A number of extensive quarries have been opened in Stirlingshire since the advent of railways. These have competed with the local quarries in supplying stone to both Edinburgh and Glasgow. The most important are those of Dunmore, Polmaise, and Plean, in the neighbourhood of Bannockburn, where the coal measure sandstone terminates. The stone obtained from these quarries is durable, but it is not of such a fine quality as that supplied by the quarries in the neighbourhood of Edinburgh. A number of the houses recently built on the south side of Edinburgh have been constructed of stone from Stirlingshire. In Fifeshire there are a number of quarries, the most important being the Grange and Callalo Quarries, near Burntisland, from which the stone employed in building Fettes College, Edinburgh, is being obtained. The Unitarian Chapel in Castle Terrace and some streets on the north side of Edinburgh have been built of the same material, which was also used in the restoration of St Giles' Cathedral. On exposure to the atmosphere the stone assumes a dark colour, and appears to require careful selection on the part of the builders. 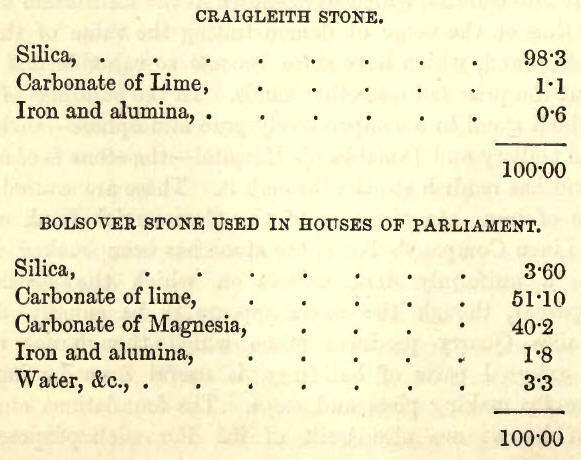 A variety of freestone obtained from the coal measures in the Wishaw district has recently been introduced by the Edinburgh builders, and is being used in the erection of villas and streets at the south side. Most of the new houses bordering on the West Meadow are composed of it. Cockburn Street is built of a stone also brought from the west, the quarries from which it came being at Bishopbriggs, on the Edinburgh and Glasgow Railway. The houses of Glasgow have been chiefly built of stone obtained in the immediate neighbourhood of the city. Good building stone is abundant all through the west of Scotland from the Clyde to Dumfries, and patches exist at various places in the east and south-east. To the north of the Ochil range the rock for a long distance belongs to the old red sandstone. The Scottish Central Railway passes over that formation during its entire route from Stirling to Perth, and the North-Eastern runs on it from Perth to where the line enters the Grampian range. The stone all through the district referred to is suitable for building purposes. It is durable if used with the strata lying horizontally; but if laid with the strata in a perpendicular position it wears away rapidly. Cases of decay arising from ignorance or neglect of this peculiarity may be seen in the houses of Perth. About 2000 men are employed in the freestone quarries. They receive from 20s. to 25s. a-week, which is an increase of 25 per cent. on the wages paid twenty years ago. Steam-power is extensively used in the quarries to work cranes, pumps, and inclined planes. A large number of horses are also employed. Several attempts have been made to dress or prepare the stone by machinery, but one after the other these have failed, except in the dressing of the old red sandstone of Forfarshire, where the planing process has been very successful. The nearest approach to success in local freestone has been made by Messrs Watherstone, builders, Edinburgh. The stones are fixed to movable parts of the machine and their surfaces are dressed by rubbing one against the other. There are two counties in Scotland which produce paving-stones —Forfar and Caithness. The pavement quarries of Forfarshire are the oldest and most extensive in the kingdom. Of late years the trade has been largely developed by the introduction of planing, cutting, and dressing machines. The planing-machine now in use in almost all pavement quarries was invented by the late Mr James Hunter, of Leysmill, near Arbroath, who was for many years manager of the quarries belonging to the late Mr Lindsay Carnegie, of Spynie and Boysack, and now to his son and successor in the estate. Mr Carnegie, a public-spirited and kindly gentleman, took great interest in the quarries, as well as in the workmen employed about them; and it was chiefly owing to the encouragement received from him that Mr Hunter was able to complete his useful invention. But, important as the planing-machine has proved to be, it has been eclipsed by the stone-cutting and dressing-machines invented by Mr Hunter's son, Mr George Hunter, now of the Welsh quarries, in conjunction with Messrs Munro & Company, of the Arbroath Foundry. The machines, which are sent to all parts of the country where there are quarries, form a considerable article of manufacture at Arbroath. Had it not been for them, the pavement trade could never have attained its present dimensions. The cutting-machines are of great strength, and consist of a series of chilled iron tools placed in revolving discs, by means of which great slabs of stone are cut through or split up with as much ease as if they were pieces of card-board. The dressing-machines are used for dressing stair- steps, coping, and much of the general mason-work still commonly done by manual labour. The Forfarshire pavement quarries, which these machines have been largely instrumental in making famous, extend from Leysmill, in the east, which is situated about three miles inland, to near the fine old castle of Glamis, in the west—a distance of about sixteen miles. From north to south, they stretch from Montrewmont Muir to the Sicllaw Hills—about twenty miles. The quarries are thus all situated in the southern or more lowland portion of the county. The pavement produced throughout this district, as well as that worked in the neighbourhood of Arbroath, is known in commerce as "Arbroath pavement." The material is a freestone, and is found in the lower beds of the Devonian or Old Red Sandstone formation. It is solid in composition, and therefore very durable, but is easily worked and dressed. It is extensively used, not only for paving streets, but for all inside work of houses, and for other purposes. At the eastern point of the geographical line described are the Leysmill Quarries. These have been worked for about half a century, and for the greater part of that time by the late Mr Carnegie, of Boysack, the proprietor. The present lessees are Messrs Straton and Cargill, who employ about sixty men, belonging chiefly to the villages of Friockheim and Leysmill On the Guthrie estate is Montrewmont Quarry, tenanted by Messrs Baxter & Mann, who have three planing-machines, and employ from fifty to sixty men. Bordering on this, on the estate of Turin, there is a quarry called the Dub, which is tenanted by Mr James Hall, the oldest quarry- master in Forfarshire. Mr Hall has one planing-machine, and employs twenty men. The two quarries just mentioned were opened about ten years ago. The next quarry to the westward is Tillywhandland. It is situated in the parish of Aberlemno, belongs to Mr P. H. Thorns, and is leased by Mr David Wilkie. Further on is the Myrestone Quarry, on the Pitscandly estate, tenanted by Mr John Gray. Each of these quarries employs one planing-machine and twenty or thirty men; in the latter there is also a ridge-stone machine. In this district a durable but heavy grey slate for roofing was formerly worked; but it is now generally discarded in favour of the thin blue slates. The Carsegownie, Tolbooth, and Balma¬shanar Quarries, the latter of which is one of the oldest in Scotland, are situated in the neighbourhood of the town of Forfar. Carsegownie is worked by Mr David Murray; Tolbooth, by Messrs Thomson & Brown; and Balmashanar, by Mr David Barry. Each employs from twenty to forty men. With the exception of Leysmill, the pavement from the whole of these quarries has to be carted a distance of from three to four miles to the nearest railway station. Further south are the Carmylie Quarries, which are the most extensive in the country. They are situated six miles from Arbroath, in the parish of Carmylie, which forms part of the south-eastern breast of the Sidlaw Hills, and consists chiefly of a series of high grounds scarcely approaching to hills, with their intervening valleys running from south-west to east. The quarries belong to the Earl of Dalhousie, and are at present leased by Messrs Duncan, Falconer, & Co. They have been worked for several centuries all over the parish. About seventy years ago the parish was tenanted by an industrious and intelligent race of workmen. At that time the land was still divided into small farms and pendicles, and each farmer was allowed the liberty of quarrying on his own farm. The farmers generally worked in the quarries from the time they got the seed into the ground until harvest. The principal quarrying in those early times was for slates, which were carted in large quantities to Dundee and the neighbouring towns, and also shipped to Leith, to be used in covering houses in that town and in Edinburgh. It was in the beginning of the present century that the Carmylie Quarries began to be worked for pavement to any considerable extent. The farmers, who were still also the quarrymasters, quarried the stones from 1 to 11 inch thick, and carted them in their milk-carts to Dundee and Arbroath, where they were sold at the rate of 2s. 6d. a load. About sixty years ago the farmer of East Hills of Carmylie, on whose farm the principal quarries were and still are situated, had seven or eight men quarrying. After they had made several searches for good pavement, the foreman told his men to take up their tools and go home to their master to tell him that the quarries were done ! Soon after that all the quarries were let to one tenant, who shipped to Leith and Glasgow. The late Mr Fyfe, father of Mr Fyfe of Messrs Mather & Fyfe, pavement merchants, Glasgow, was the first to sell Carmylie pavement in Glasgow. He was then the only pavement merchant in that city. At that time the quarries began to be worked on a more extensive scale. Windmills, with movable wooden frames, were erected for the purpose of pumping the water; but that arrangement, which was long in use, was sub¬ject to the drawback that, if there was no wind to drive the mills, the quarrymen could not work. About forty years ago there was so much difficulty in getting rid of the water that a drain, running through a large part of the parish, and a portion of it tunnelled through a hard sandstone rock, was constructed, at a cost of L.3000, for the purpose of draining the principal quarry. The machinery employed at that time consisted of a small single-power crane, which with care might be made to lift a stone a ton in weight. The present state of things at Carmylie is much different from what it was even twenty or thirty years ago. There are about 300 men in constant employment at the place. The machinery consists of eight planing-machines, several cutting-machines, eight saws for jointing pavement, one machine for making steps, coping, and tabling; two polishing-machines, six steam-engines, and from twelve to fourteen steam and other cranes. The quarries turn out almost any weight or size of stones—some weighing twenty tons and measuring 20Q feet superficial. The Carmylie stones are famous for paving, and for steps; cisterns for paper-makers, chemical works, and bleach-fields; columns, balustrades, and other architectural ornaments. For these and similar purposes they are widely exported to the chief cities of the United Kingdom, to many countries in Europe, to the United States, Australia, and the colonies generally. Many towns in Scotland are paved with Carmylie stones. They have been, or are being, used as paving, steps, copes, &c., at a large number of public buildings—such as the new University of Glasgow, the New College, Edinburgh, the Bank of Scotland, Edinburgh, all the principal buildings in Aberdeen, the Perth railway station, &c. The weight of stones sent away from the Carmylie Quarries daily is about 150 tons. A single line of railway extends from the quarries—the rails going to the bottom—to Elliot Junction, near Arbroath, a distance of five miles. The Carmylie Railway, as it is called, passes near the village of Arbirlot, and skirts the beautiful Kelly Den, which is of so much interest to the geologist. The line was constructed by the Earl of Dalhousie, who sold it some years ago to the Caledonian Railway Company. It is used exclusively for the carriage of paving and other stones from the Carmylie Quarries. The quarries are a great benefit to the parish, as most of the workmen reside there. They are an industrious, sober, and saving class. The greater number of them have a piece of land, and keep a cow or two. Intoxicating drinks are not allowed to be sold in the parish. South from the Carmylie Quarries are those of the Gwynd, which belong to Mr Pierson, and are leased by Messrs Barrie & Galloway. There are three planing-machines at these quarries, and from sixty to eighty men are employed. The Pitairlie Quarries, in Monikie, belong to Lord Dalhousie, are tenanted by Mr David Barry, and about fifty men are employed. Westward are the Gagie, Wellbank, Kingenny, and Duntrune Quarries, each employing a considerable number of men. Duntrune produces pavement, but yields thick rock in greater abundance. With this exception, all the others mentioned are strictly pavement quarries. Although not immediately belonging to the industrial part of the history of these flagstones, it may not be uninteresting to note the fossils of Carmylie—especially the "Seraphim" of the Forfarshire quarryman, this being one of the earliest discovered. A figure of it is given in Plate IX. of Mr Hugh Miller's "Old Red Sandstone." At the time that lamented gentleman wrote his fascinating book, nothing was known about these puzzles beyond the quarryman's name, until the genius of Agassiz, on baying a lot of the fragments laid before him, pronounced them to be "remains of a huge lobster;" and the correctness of that opinion has since been demonstrated by some almost entire specimens of these crustaceans having been turned up; one of the largest—or rather a good portion of one—discovered in Carmylie Quarry in 1861, showing tail-plate and eight post thoracic segments. This fragment measures in the cast fully 3L- feet in length. The animal, when entire, would no doubt be 6 feet long. It is now in the museum at Arbroath, and is one of the "lions" there. Cephalaspis, with a few plants and masses of "Puddock's spue," also occurred with the Pterygotus (the name now given to the "Seraphim)." When Hugh Miller wrote these were the only fossils known in the Forfarshire rocks. Now, through the industry of the Rev. Mr Mitchell and others, and especially the zealous labours of Mr Powrie of Reswallio, fossils have been found in abundance in various parts of the county, and many interesting new genera and species of fossil fishes and crustaceans have been added to the list. The pavement quarries of Caithness are of considerable extent and importance, and their produce has a world-wide reputation. The working of the quarries and the dressing of the stones constitute a considerable part of the industry of the county, employing more persons than any other kind of trade, exclusive of agriculture and fishing. Considering the natural disadvantages which it lies under, the county of Caithness has made great progress during the present century. Agriculture has been advanced, the fisheries have engaged much attention, and the manufacture of pavement has added to the growing prosperity of the people. The county is largely indebted for the development of its industries to, among others, the late well-known Sir John Sinclair, of Ulbster, and the late Mr Trail of Ratter. The son of the last-named gentleman—Mr George Train, the present much-respected Member of Parliament for the county— has worthily continued the work begun by his father, and has especially taken a deep interest in the working of the pavement quarries. Mr Sinclair, of Forss, also deserves to be mentioned for the part he has taken in developing the pavement trade. The Caithness flagstones belong to the middle formation of the Old Red Sandstone. Great numbers of fossil fish and plants are found intercalated among the flag-beds of commerce, having been buried in the ancient mud of the Old Red waters. These fossils appear on almost every slab of Caithness pavement, but although the fish remains lie by thousands it is seldom that anything like a perfect specimen is got. However, they are beautiful in their ruin— their blackened, enamelled, and glistening scales and plates standing out in contrast with the sober grey of the matrix. The flag-beds have suffered much in geological ages from dislocations by "faults" and other causes. Sir Roderick adds, "These results completely sustain the opinion I was led to form on the spot, that the peculiar tenacity and durability of the flag-stones is due to the manner in which silica and alumina are cemented together by certain proportions of calcareous and bituminous (organic) matter." A portion of bituminous schist got near Barrogill Castle was analysed by Dr Hoffman, and yielded, of fixed matter (mineral), seventy parts, and of volatile matter (organic), thirty parts. These oil-yielding shales may some day be considered worthy of special attention. They exist in great quantities. As a proof of the durability of the Caithness pavement, a circumstance which occurred a few years ago may be mentioned. A fire broke out in a building in Leith Walk, Edinburgh, and the hose for the engines was laid across the road. The ordinary traffic line being thus impeded, the cabs, carts, and waggons, some of the latter heavily laden, took to the footway, and the consequence was that for nearly 200 yards the sandstone flags—from the north of England and other places—were broken under the unusual weight, whereas a portion, several feet in width, of the same road, laid with Caithness flags, bore all the traffic without being injured. The principal pavement quarries in the county are situated on a line extending from the parish of Olrig, on the shores of the Pentland Firth, to the Parish of Reay, in the west—a distance of ten or twelve miles. Another run of pavement commences at the seaside four miles south from Wick, and extends westward to the parish of Falkirk, in the centre of the county. The first exportation of pavement was made from quarries on the Crown lands of Scrabster, formerly belonging to the bishopric of Caithness, and situated near Thurso, in one of the most cultivated parts of the county. It is believed that, centuries ago, slates quarried at Scrabster were exported to the south. There were no roads in Caithness at that time, nor any carts, and, until a comparatively recent period, the slates were carried on the backs of the workmen to the shore, and put on board ships lying in Scrabster Roads. They were for the most part shipped to Leith, and many of the houses in that town, and in the old part of Edinburgh, are roofed with slates from the Scrabster quarries as well as from those of Carmylie. The principal flagstone quarries in Caithness are those of Castlehill, which are worked by the proprietor, Mr Trail, ALP., under the management of Mr M‘Beath, who has been in charge for nearly forty years. Although these quarries are the most important in the county, they are not the oldest. They were begun by the present proprietor's father, a gentleman who, as already hinted, took a leading part in everything that was likely to prove beneficial to Caithness, and one of whose chief motives was to find employment for the honest and industrious people around him. Mr Train introduced many improvements on his estate, and, in order the better to carry these out, he built two harbours—one at Castlehill, in Dunnet Bay, and one at a place called Ham. Quarrying was then begun and a number of workpeople were attracted to the district. For their accommodation, and to encourage them to settle there, this public-spirited gentleman feued off at a cheap rate a portion of ground, and, free of charge, gave stones to his workpeople with which to build houses. In that way was built the large and thriving village of Castleton, situated on the shore of the Pentland Firth. The building of this village has secured a race of steady, industrious workmen for the quarries. The village, which attracts the notice of the traveller by its order and cleanliness, possesses several schools, churches, and a public hall. Mr Trail takes much interest in the working population of the place. The Castlehill Quarries are very favourably situated, and have the advantage over all the other quarries in the county of being close to the seaside and to Castlehill harbour. It was from the Castlehill Quarries that pavement was first exported from Caithness in large quantities, and they continue to take the lead. The quarrying is easily effected, as the stone readily opens up in the natural layers and seams. Immense slabs are detached from the top of the exposed rock, and these are broken up into square pieces of various dimensions. The stones are then placed in trucks, and conveyed along a railway to the cutting and polishing sheds, which occupy the ground between the quarries and the harbour. The sheds are furnished with sawing and polishing machinery, driven by a combination of steam and water power. Usually there are half a dozen vessels at a time in the harbour loading pavement from Mr Trail's quarries, so that a large amount of capital and labour outside the locality is employed in the trade. In the quarries, and other departments of the works, Mr Trail employs from 350 to 400 men. The great establishment on the River Plate, in which Baron Liebig's extract of meat is manufactured, is floored throughout with stones from the Castlehill Quarries, and the cleanliness secured by their use is specially noticed by all visitors to the place. In the same beds as those of Castlehill there are several quarries belonging to Mr Smith of Olrig. These are worked by Mr John Swanson, who has another quarry on his own property in the Hill of Forss, near Thurso. Mr Swanson has to cart his pavement to Thurso for shipment—a distance of five miles from Olrig, and three miles and a half from Hill of Forss. All the quarrymasters of the county, with the exception of those of Castlehill, Forss, and Barrogill, have their machinery at Thurso, on either side of the river, and this is an important item in the industry of the most northerly town on the Scottish mainland. Near Mr Swanson's are the quarries on the Ulbster estate, belonging to Sir John G. T. Sinclair, and tenanted by Messrs Craig & Son, Mr Innes Dunbar, and Mr Gerrie. Mr Gerrie and Messrs Craig have a quarry each in the Hill of Forss. -Westward are the Forss pavement quarries, worked by the proprietor, Mr James Sinclair of Forss. Forss quarries are second only to those of Castlehill in the number of men and the extent of machinery employed, and it is worthy of mention that it was at them that machinery for "jointing" stones was first employed. Further west is the Reay Quarry, situated in the parish of that name, on the border of Sutherlandshire, and on the estate of Sir Robert C. Sinclair. All the principal pavement quarries are situated in the three parishes of Olrig, Thurso, and Reay, which form the north-western shoulder of the county. Returning to the second geographical line described, we come to the Holm Head quarry, on the coast south from Wick. Nearly forty years ago a few men were quarrying there on the edge of the cliff, when a portion of the rock fell away, and carried two of the men with it. Both were killed, and since then no work had been done at the quarry till about a year ago, when operations were resumed, though not extensively. Some twelve miles inland are the quarries of Banniskirk, tenanted by Mr L. Dunbar; and Spittal, leased by Messrs Shearer & Son. Both are distant from Thurso, the place of shipment, about twelve miles. The most northern quarry in the county is at Barrogill. It is worked by the proprietor, the Earl of Caithness. His lordship has persevered in quarrying—though not, it is believed, very profitably as yet—in order to give employment to the labouring people in the district. The pavement quarries had a marked effect on the wages of the labouring class in Caithness, which have risen from 7s. or 8s. a-week to from 12s. to 18s. There are no statistics of the quantities of pavement exported annually from Caithness, but it is roughly estimated that from 500,000 to 600,000 superficial yards are shipped every year, the value of which is from L.70,000 to L.80,000. The date at which slate for covering houses came into use in Scotland is not known, but there is good reason for believing that it was at least three centuries ago. Though slate suitable for roofing purposes exists in various localities, the earliest used would appear to have been derived from the island of Easdale, which for upwards of two hundred years has been one of the chief sources of supply. It is stated that among the ruins of a castle in the north of Scotland, which was built in the fifteenth century, fragments of slate similar to that obtained at Easdale were discovered. There is evidence that the Falconer's Castle at Appin was in 1631 roofed with Easdale slates. Ardmaddy Castle, a seat of the Earl of Breadalbane, built in 1676, was covered with slates of the same kind. In the latter case they were fastened with wooden pegs, and have withstood the tempests of nearly two centuries without requiring to be replaced. Of greater extent than the Easdale quarries, and of equal fame, though some years younger, are those of Ballachulish. The other slate quarries in Scotland are not of much account. The island of Easdale is so small and so uninteresting in appearance that persons passing it on the route to Oban would not devote a moment's attention to it were it not pointed out as the seat of the famous slate quarries. It forms one of the group of small islands which skirt the coast of Argyle between Crinan and Oban, and lies close to the south-west point of the island of Seil. There is an eminence about 130 feet in height towards the north end, but the greater part of the island rises little above the high water level. In outline it is irregular, and its extreme measurements are 850 yards by 760 yards. The island is composed chiefly of clay-slate, the other rocks being limestone and trap. Mr John White, who was manager of the quarries for upwards of twenty years, gives the following account of the disposition and character of the slate:— "The slate-bands appear in two seams, which are much contorted throughout the whole extent of the island. These seams are made up of different beds, ranging in thickness from a few inches to many feet, like our sandstones and limestones, but frequently so closely united that only a practised eye can detect the line of contact; whilst the superinduced phenomenon of cleavage constitutes a distinct dissimilarity between them and the other rocks referred to. It may be noticed, as an indication of the sedimentary character of these slate rocks, that there is a decided difference in the quality of the upper and lower portions of the thicker beds, the former being fine grained and smooth, and the latter coarse and gritty—the feature which we recognise as analogous to that exhibited by other rocks of sedimentary origin. Although the slate-seams are so much contorted as to be found at various angles with the horizon, the cleavage plane invariably maintains an angle of thirty-seven degrees to a vertical line, from which it may be inferred that the property of cleavage was imparted to the rock subsequently to its being disturbed from the horizontal position. Where the rock has been least disturbed from the horizontal position it is more easily quarried, and yields better slates. The slate beds are much affected by what the quarriers call cuts.' These are joints which intersect the strata in a nearly vertical direction. Sometimes their presence is advantageous, but when they are too numerous the stone breaks up into useless fragments." The slate-seams extend across the channel, 150 yards in width, which separates Easdale from Seil, and crop up on the shore of the latter island, where they are worked at two points, known locally as the Ellenabeich Quarries. The first visitors to Easdale found the shores strewn with slates quarried and split by the action of the waves; and from the supply thus provided was taken all that was required for many years. By the time the shores were cleared of the loose stones the value of the slate had come to be more fully realised, and to meet the demand which had arisen quarrying was resorted to. The exposed strata on the sea-shore were first worked, and the process of quarrying, as handed down by tradition, was this : At low water wedges of seasoned oak were driven into the cleavage seams, and when the tide flowed the wedges expanded and detached the superincumbent rock. That was a slow and uncertain process, and in course of time was abandoned for blasting by gunpowder. When the seams of slate had been worked down as far as the tide would allow, the persons engaged in quarrying began to look upon their occupation as in danger of extinction, and some of them actually left the island. The trap dykes which occur in the seams and divide them into compartments had, when reached, evidently led the quarrymen to conclude that they had got to the limits of the slate deposits. Those of the workmen who remained on the island "explored" the ground, and opened a quarry a little distance from the shore. Hydraulic engineering was but little understood by them, and they were again cast into a state of despair by an accumulation of surface water in the quarry. In order to get rid of the water they cut a trench down to the sea on the level of the ebb-tide line, and by means of that ran off the water that accumulated between the ebbs, the rising tide being prevented from getting into the works by a sluice fixed in the channeL The men never dreamed of being able to carry on their work at a lower point than that which their drain enabled them to reach; and it is related that, on the occasion of an unusually low tide, one of the workmen fired a blast which he boastfully exclaimed was "the lowest that would ever be set off in Easdale." How much this prediction has come short of verification will be seen further on. In those early days of the quarries the men were assisted by their wives and families, the slates being carried from place to place in "creels" on the backs of the women. The mode of working the quarries was revolutionised some time in the course of last century by the introduction of a pump which was obtained from the wreck of a castaway ship. As the pump enabled the workmen to keep clown the accumulations of surface- water, the quarries were sunk beneath the sea-level, and thus the beds of slate which had been abandoned for ever, as the quarriers thought, were got out. Finding that the employment of the old pump gave them such a great advantage, the men next obtained a crank-pump fitted with a fly-wheel—a machine which was regarded with admiration by the islanders. The slate strata in the interior of the island were next broken into, and a number of quarries were opened, for which pumping machinery of an improved kind was introduced. Among the new appliances was one of Newcomen's atmospheric engines, which, when it was set to work, excited much wonder among the workpeople. The engine would appear to have been of very rude construction. The boiler consisted of a square box of cast iron one inch in thickness, and the piston was "packed" with leather. As the engine could not be worked profitably, horse power was substituted in the beginning of this century, and the introduction of horses for that purpose suggested the substitution of carts for wheelbarrows in drawing the slates out of the quarries. About the year 1807 a windmill was erected to work the pump of the principal quarry, and gave great satisfaction. With a moderate breeze it worked very effectively, raising the water through a seven- inch pipe from a depth of fifty feet. The windmill continued in use for twenty years, and the part of the works with which it was connected still bears the name of the Windmill Quarry. In 1826 a powerful steam-engine was erected in such a position as to be available for pumping three quarries. About the same time wharves were erected for loading ships, and these were found to be a great convenience, the practice previously being to anchor the vessels in the sound, and carry the slates to them in boats. Railway inclines were subsequently constructed in all the quarries. These were at first worked by horses, but for a number of years past steam-power has been employed. For a long period prior to 1841 the quarries had been leased to a company in which the successive representatives of the house of Breadalbane were shareholders. On the expiry of the lease in the year named, the late marquis determined to work the quarries on his own account, and continued to do so up till his death in 1862. Many improvements in the mode of working the quarries and in the condition of the workpeople were effected during the rule of the marquis. When the quarries were worked by a company, the workmen were paid only once a-year, and then only according to the quantity of slates that had been sold, no reckoning being made for the quantity added to stock. The marquis introduced the system, which still prevails, of paying at short intervals without reference to sales. When the present marquis came into possession, he undertook the working of the quarries, but under great disadvantages. Some of the embankments had given way, and a large portion of the workings was flooded. In 1866 the marquis let the quarries to a company of the workmen formed on co-operative principles. Though they obtained the quarries on highly favourable terms, the company did not succeed; and their affairs were wound up after a year's trial. The quarries were then acquired by a company of slate merchants, who have continued to work them with great vigour. The principal quarry at Ellenabeich is about 450 feet in length, 250 feet in width, and 160 feet in depth. The Windmill Quarry in Easdale is 250 feet in length and breadth, and 120 feet in depth. Two powerful steam-engines are employed for raising the material and keeping the quarries clear of water. About 300 men and boys are employed. The number of slates turned out annually cannot be less than from 7,000,000 to 9,000,000; the average from 1842 to 1861 was 7,000,000. Taking the value of the slates at the quarries to be L.2 a thousand, the total produce will, according to the lowest computation, be worth about L.14,000 a-year. The slates are well known in the market, and command a ready sale—it being no uncommon thing to find above a dozen vessels, of an aggregate burthen of over 1500 tons, waiting their turn for loading. The population of the village of Ellenabeich is about 350, and of Easdale 450, all of whom are dependent upon the quarries. Almost without exception, they are natives of the locality, and, as is usual in the case of communities remote from the great centres of population and industry, they are somewhat primitive in their habits and modes of life, and not quite free from superstitious beliefs. The men are strong and hardy, and there are no more skilful or daring boatmen on the British coast. All the adults can read and write, and the rising generation are well provided with the means of education. Some years ago a Young Men's Association was established and a library formed. Lectures have at various times been delivered on scientific and popular subjects. Gaelic is the language commonly spoken, but most of the people know English to some extent. It is said that so little are the quarry populations given to changes of residence, that the removal of a family from one side of the sound to the other is quite an affecting incident, accompanied by no little shaking of hands and even shedding of tears. Visitors to the quarries will have their attention arrested by slabs of stone set up on end near the houses. These are tombstones which the men have prepared to mark their own graves. In the course of their operations in the quarry the men occasionally meet with stout slabs of hard stone, and these are purchased and preserved as indicated until required. The Ballachulish Slate Quarries are situated in the north of Argyle- shire, on the shores of Loch Leven, about two or three miles from the scene of the tragic massacre of Glencoe. There are two quarries about half a mile apart, and named respectively the East Quarry and the West Quarry, the latter being the smaller of the two, although the first worked in the district. It was opened in or about the year 1697 by the proprietor, Mr Stewart of Ballachulish, from whom Sir John Stewart, the late vice-chancellor, is descended. On slate being discovered, men were procured from Easdale to teach the people of the district how to quarry and dress it. The West Quarry was worked on a small scale by Mr Stewart for many years. When the discovery of another vein of slate, further to the east, was made about the year 1780, the old workings were stopped for a time, and the East Quarry was opened. Subsequently the quarries were let for a number of years, first to Mr Stevenson, and afterwards to Mr Rawse. At the end of Mr Rawse's lease, the proprietor (a descendant of Mr Stewart, who opened the quarries) took them into his own possession, and kept them working until, from pecuniary difficulties, the whole of the Ballachulish estate went into the market, and was purchased, in 1862, by Mr Robert Tennant of Leeds, the present proprietor. Mr Tennant let the quarries to Mr Alexander Pitcairn, who re-opened the old workings at the West Quarry in 1863. After much labour has been expended in clearing away the rubbish left by the previous workers, the West Quarry promises to produce excellent slate. The East Quarry consists of five working levels, four rising one above the other from the ground level, and one being sunk about sixty feet below the surface. The face of the quarry, measuring from the top of the highest level to the ground line, is about 300 feet; and when it is taken into consideration that the ground area already quarried measures from five to six acres, some idea may be formed of the vast amount of solid rock that has been cut out. The rubbish from the quarry has been run out into the sea, and forms two great banks. A third bank runs out from the West Quarry. There are two upper levels and one sunk level in the West Quarry. The men who work in the quarry are divided into "crews" of five, six, or seven. Each crew choose a certain part of the rock face on one of the levels, and make a kind of bargain with their employer to work that particular spot for a year, receiving a sum of money agreed upon for every thousand slates made by them, so that their wages depend upon the diligence with which they work as well as upon the quality of the rock they may select. The slates are divided into four classes—viz., "Duchess," "Countess," "sizable," and "undersized." The first mentioned are the largest, being twenty-four inches long by twelve broad; while the " Countess " slates are twenty by ten inches. The other two classes are smaller. Each crew makes the four kinds, should the quality of the rock allow it, and receives a different sum per thousand for each sort. In working, some of the crew stay always in the quarry and blast the rock face, while the others are out upon the rubbish bank splitting up the blocks furnished by their comrades. The Ballachulish quarriers are said to be the best blasters of rock in Scotland. Slung up the face of the perpendicular rock on a kind of chair attached to a rope fixed at the summit of the level, the worker hammers away at a sharpened iron rod known as a " jumper." When he has finished the "bore," a charge of gunpowder is inserted, and fired with a slow match. So well is everything arranged, that in the memory of the present generation only one man has been killed by a blast, and in that exceptional case it was entirely the man's own fault. After the charge is expended, the workman climbs up the rope, which he fixes round his leg in a peculiar manner, and placing his feet against the perpendicular face of the rock, loosens with a crowbar the masses of stone that have been shattered by the explosion, and sends them crashing down the steep. When a large bore has to be made, a staging is fixed in the face of the rock, on which three men work, one holding the "jumper" while the other two strike it with heavy hammers. After all the loosened rock has been brought down, the quarry detachment of the crew break the large masses into smaller blocks. Those of good quality are then selected and sent in waggons out to the bank, where they are split and dressed. The splitters are very expert at the work. Two good hands, the one splitting and the other dressing, provided they are supplied with blocks of a good quality, can easily make from 1800 to 2000 slates a-day in summer. The rubbish is sent away in waggons, to be thrown over the edge of the bank. At that spot are stationed numbers of boys, from eight to fourteen years of age, who watch the rubbish projected from the waggons, and, pouncing upon a block that may have a promising appearance, split it into slates. The only kind of slates made by the boys are the undersized. Iron rails or tramways extend in every direction through the quarry, along which horses draw the waggons laden with slates, rubbish, or blocks. If placed in a straight line, the railways would measure above six miles in length. There are several inclines, with machines attached for letting the waggons down from the upper levels. The largest of these inclines is 530 feet long, and exceedingly steep. There are also three steam-engines used—two at the sinking level in the East Quarry, and the other at the West Quarry. There is a small harbour between the two rubbish banks at the 'East Quarry, where the slate vessels are laden. The number of men and boys employed is about 400, and 15,000,000 slates are turned out annually. The workmen are all natives of Ballachulish or of the hamlet of Glencoe, which lies about a mile inland The only strangers are a few Easdale families who have settled in the place. One reason why there are so few strangers is, that no adult can learn to split and dress slates so expertly as those who have been trained to the work from boyhood. The boys of the place are put to split slates when about eight years of age, or as soon as they can handle the chisel, slate-knife, and hammer; and as there is no opportunity of learning other trades, they stick to the quarry all their lives. The workmen are in general strong and healthy. The population of Ballachulish is nearly 2000. The people intermarry among themselves, very few men having wives from places farther away than Appin. There is no inn or publichouse in the village, and, except on the day or two succeeding the pay (which is monthly), when a little drinking occurs, no intoxicated person, is to be seen. Taking into consideration the extent of the village, and the social condition of the population, the drinking is nothing to what it is in Lowland mining villages of the same size, although once or twice the people have been maligned in the public prints by tourists who happened to pass through the village on a pay day. Thieving is a thing quite unknown in the locality. A peculiar trait that the people possess, in common with other Highlanders, is love of their birth¬place. Most of those who leave the place find their way back again after a time, even although they may have been better off elsewhere. A great number of them are still very superstitious, firmly believing in ghosts, in blue lights appearing on water where persons are to be drowned, and in omens of various kinds seen before a death. Persons are to be met with who profess to possess the interesting faculty of "second-sight." A very old custom still lingers in the village of holding a wake over the body of a friend or relative deceased. Another strange fashion is that of firing off a small cannon kept for the purpose when an agreement of marriage has been entered into between a youthful couple. Education is deficient, on account of the boys being sent early to work in the quarry. The women are generally better educated than the men, but with few exceptions all can read the mother-tongue, and make a pretty fair attempt at English. There are four churches in the place, viz., the Scotch Episcopal Church (which is the strongest body), the Established and Free Churches, and a Roman Catholic Chapel, but there are very few members of the latter persuasion. Schools are attached to the first three mentioned denominations, but these are poorly attended. A Mechanics' Institute, of which most of the men are members, has been erected by Mr Tennant at his own expense. There are also slate quarries at Dunkeld, Luss, Aberfoyle, and Craig- lea. Those of Craiglea are the most important. They are situated on the Logiealmond estate (the property of the Earl of Mansfield), and are about fourteen miles north-west from Perth. Craiglea is a hill 1500 feet in height, and the quarries are near the top of it. For local purposes slate was taken from Craiglea many years ago, and for upwards of a century the quarries have been worked to supply a more extended demand. The quarries had, up till three years ago, been let on lease; but the proprietor then took them into his own care, and under the skilful management of Mr John White, who for upwards of twenty years was manager of the Easdale Quarries, they are being opened up on an extensive scale. The slate vein is of excellent quality, and has this peculiarity, that, while one portion of it supplies slates of a dark-blue colour, those obtained from the other portion are of a sea-green hue; but otherwise there is no appreciable difference between them.